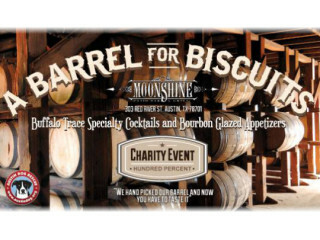 Moonshine Patio Bar & Grill handpicked a barrel of Buffalo Trace Bourbon for a night of bourbon-inspired cocktails and appetizers (including brisket on a biscuit, bourbon glazed buffalo wings and more) — all you have to do is come and taste it. It's business as usual at the restaurant, they've just expanded their menu for the evening to help raise awareness and money for Austin Dog Rescue, a non-profit dedicated to finding homes for local pups. All door donations benefit Austin Dog Rescue. RSVP through the Facebook event page.